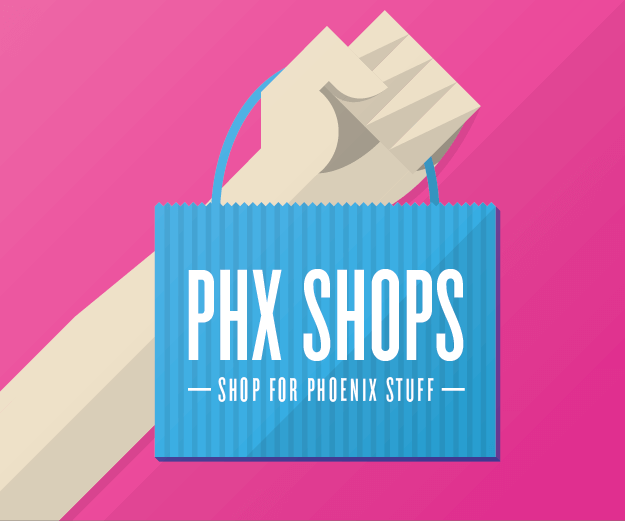 Conspire, a Phoenix art cooperative, is a coffee bar, fashion boutique, book shop, art gallery, live venue and hang-out spot all in one. 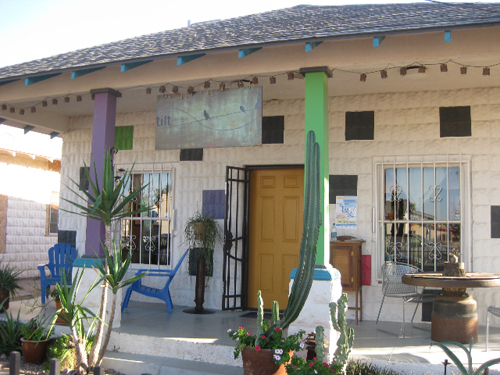 A teal bungalow tucked on the corner of Garfield and 5th streets is home to the collective. Twinkle lights illuminate the tree in front, acting as a beacon to bicyclists and windsurfers alike. Lock your bicycle to the homemade racks and take a seat with the regulars at the picnic bench out front. You may even fancy a vegan doughnut. Room 270 of Taylor Place is my home. Buddhist prayer flags line the top of the room, personal art pieces hang on the wall, my fish Monet swims on the windowsill in his bowl and a heavy scent of Plakka paint hangs in the air. My bookshelf holds existential novels, feminist magazines and my camera handbook, just to name a few. The spare bedroom is a design studio littered with sketches and paper scraps. I enjoy sleeping in my far-too-comfy bed, far too many hours a night. I’ve always loved fairy lights and nighttime bike rides through empty city streets. When I discovered Conspire one First Friday, it was packed. I honestly could not move. So, I left. But soon after, I returned. The place was quiet but welcoming, and a friend and I made our way to the back. The library, filled with anarchist novels and music zines, was overwhelmingly appealing to my taste. I am not sure how an artsy coffee shop serving my favorite food, doughnuts, in bike-riding distance from my dorm, could get a whole lot better. And, how could this converted home be any more similar to my bold, coffee-loving personality? My name is Alex Flamini, and I am a sophomore at Arizona State University. I am a first-year graphic design major. Being 19, the awe of living in the heart of the city keeps me well enough entertained. I frequently ride in Central Phoenix on my KHS, hunter green, Urban Soul, single-speed bike. Say hi if you see me. I’m looking for friends. 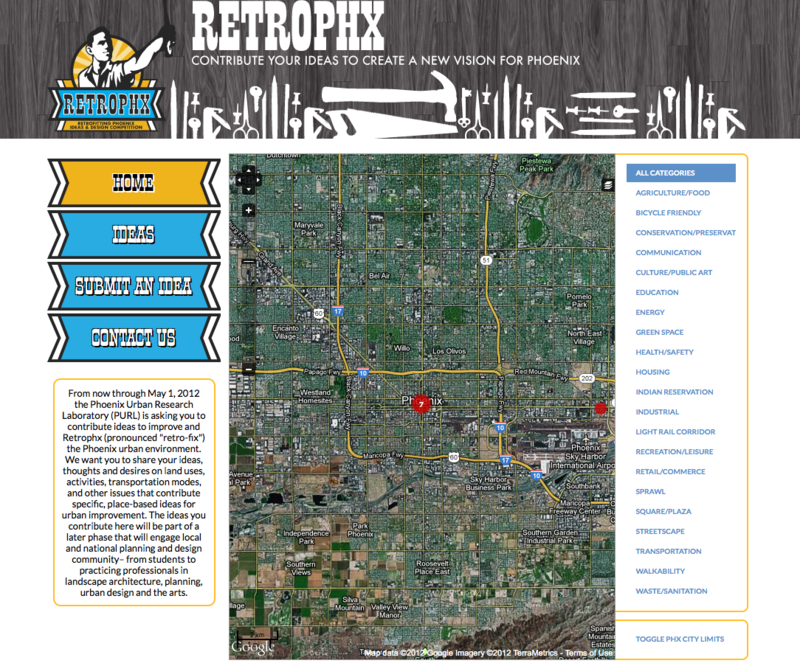 The Phoenix Urban Research Lab is sponsoring a website to inspire concrete ideas for improving Phoenix. 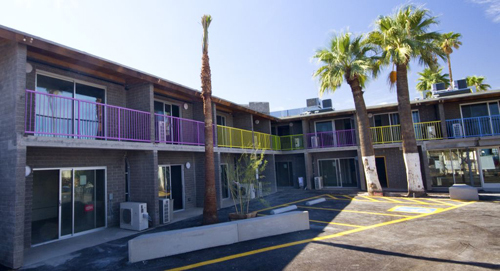 Part of the Grand Ave Fest, the Grand Avenue ReDapt Tour takes a look at re-purposed buildings along Phoenix’s iconic highway. Grand Avenue is getting a facelift with the adaptation of the motor hotel Oasis on Grand into affordable live/work spaces for artists as a way to contribute to the revitalization of the neighborhood. 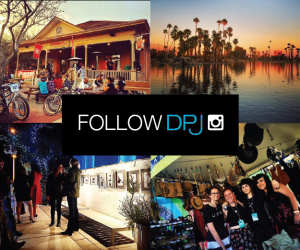 Phoenix Design Week(s) hosts a stellar schedule of events and welcomes the national AIGA and UCDA Conferences to Phoenix. Chow Locally brings local farmers and local consumers together to save money, waste less food and make getting local eats onto local plates easier. Locally owned Red Hot Robot, Frances and Smeeks sit neatly in a row on the corner of Central and Camelback. Each store radiates friendly intimacy. Starting October 1, US Airways Center tickets displaying the Rail Ride Event logo will be good for the event and rides on the light rail. Downtown Phoenix’s newest addition, CityScape, celebrated the “Topping Out” of their 27-story Phase I office tower yesterday. Phoenix Mayor Phil Gordon and Arizona Governor Jan Brewer joined management leaders from RED Development and Hunt Construction Group at the ceremony to announce nine new tenants signing on for CityScape’s Phase I office tower. The tower is slated to open in Spring 2010. Kyle Hildebrant: entrepreneur, bike commuter and Japanese chef. Hildebrant is the Principle Partner of the Phoenix branding company, Ovo. “We utilize things like design, and advertising, marketing, and interactive design all from like a branding perspective,” he explained.